L'occitane's body care products are my all time favorite and they are in a constant rotation all year round. My favorite is their Shea Butter products because they work beautifully for my dry skin. I love baths and you might have already seen this Lavender Foaming Bath a million times on my Instagram and that's purely because I love it so much. 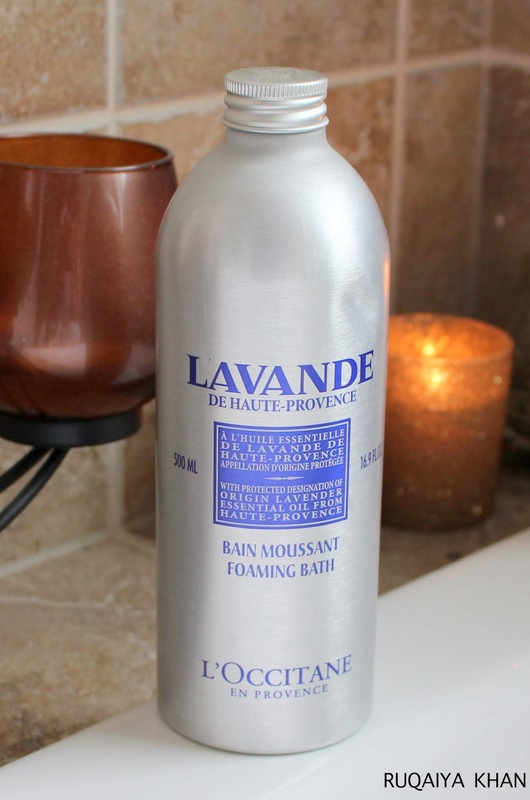 Every time I soak in with the L'occitane Lavender Foaming Bath I feel so relaxed - its creamy bubbles not just cleanse but also hydrate my skin which feels very soft after a bath. Love the heavenly lavender scent which is actually a lot better than my garden lavender or any of the essential oils I own. I always keep dried lavender flowers in my bath because of its calming effects on me and also a lavender essential oil roll-on that I rub on my wrist before bed. This is the perfect bath before bed, or just about anytime of the day when I am feeling a little overwhelmed. Working from home really does take its toll on me and its the little things like this that makes it a bit more bearable. Jokes aside, take a look at those glistening bubbles! I love how quickly it foams up and lasts for 20 minutes or more. I usually bath for about 20-25 minutes and it relaxes me completely. There is no residue on my skin nor any colour staining on my bath tub. I only rinse with water and my skin feels amazing!! Sometimes, I would use a body scrub after a bath for extra exfoliation or before a major event but mostly, its only this foaming bath that gives me hydrated, smooth and soft skin. I would highly recommend L'occitane's Lavender Foaming Bath for the ultimate calming experience that relaxes all my senses and energizes me to take on whatever life throws at me. I look forward to half an hour of alone time, without any interruptions from technology or family and just focus on my self and my well being and I am extremely happy how this bath helps me achieve that.